The mysterious linear pond at the country park does seem to be an anti-tank ditch, one of many disconcerting objects and shapes scattered along the Bay. For example the map above is from Armstrong 1769, part of the report and more of less the area of the Bay for which Banks the mining company are hoping to develop as a new open cast. At the southern end of the map is “Blakemoor Hall”, and, maybe “Cook esq”. I am not sure what the Hall could be (if anyone knows I'd be grateful to hear), having always assumed the row of houses at Blakemoor farm, just as you walk into the hide at Cresswell lagoon, are much more recent with no older structures of any substance. However the farm outbuildings are older looking. 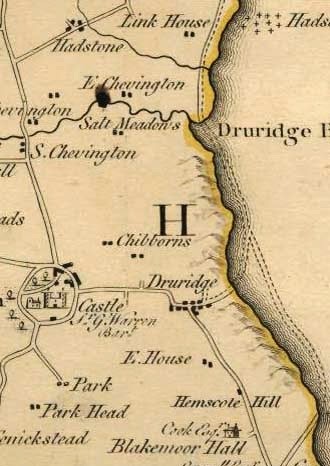 There is also a road that meanders out onto the beach from Cresswell, heading north, suggesting more use and industry than you’d find there today, barring the occasional sand extraction excursion at Hemscott. For such a walked, watched and loved stretch of coastline there remain many uncertainties. From the Neolithic footprints in the peat beds and flooded forest stumps, through the medieval at Chibburn to the WW2 pill boxes the Bay seems to capture time. Whereas an egg timer’s sand marks the tumbling progress of the time it seems that at Druridge Bay the sands clog and mire the passing years and hold all these fragments in a jumble of half forgotten histories.